Rage, The one Stephen King adaption that you will never see. There is no doubt about it, we are living in the time of Stephen King. Several of his works have been adapted already with several more on the way. Within the past year we have witnessed several of his stories come to the big screen as well the small. Netflix alone has two films coming out within the next two months; Gerald’s Game and 1922. It’s hard to guess which piece of work will be turned into a film next. However, there is one literary work that King penned that will never find the light of day. That work is titled Rage. Rage is one of King’s earliest works, and the first work to be released under the pseudonym Richard Bachman. The delicate nature of the book has since caused King to cancel its publication in 1999 and has not been mentioned since. So, what is this book? What is it about? Why was its publication cancelled and what made King state in 2007 that the book was “Now out of print, and a good thing”? Read on as we dive into the literary work known as Rage. 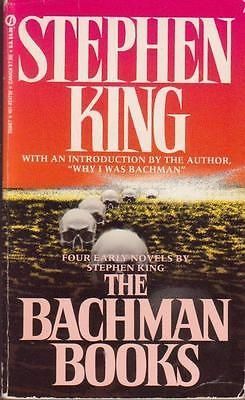 As many readers know, King went by a pseudonym early in his career, Richard Bachman. King released several books under the name including The Regulators, The Running Man, and Thinner. However, it was Rage (originally titled Getting it On) that would go on to be the least talked about Bachman book because of its content and premise. King released Rage in 1977, and then again as part of his collection The Bachman Books in 1985. It was this later release that would give the story a much wider audience. The story centers around a Maine high school student that goes by the name of Charlie Decker. Charlie is what we would call a troubled child. In the beginning of the story we witness Charlie being called into the principal’s office to discuss an altercation he had with his chemistry teacher. The altercation ended with Charlie suspended and the teacher hospitalized. Charlie still has a chip on his shoulder and verbally assaults his principal which results in his own suspension. After Charlie storms out of the office he stops by his locker, grabs a pistol, then decides to light his locker ablaze. The fire triggers the fire alarm but not before he arrives back in class and shoots his algebra teacher. The rest of the school evacuates but Charlie commands his classmates to stay behind. Charlie eventually lets his classmates go free at 1 p.m. but poor Ted can’t leave due to the beat down he received from his classmates. The police storm the room and the unarmed Charlie makes a move to make the police shoot him dead. The police do shoot Charlie, but he survives. He is then ordered through court to exist in a psychiatric hospital until he is fit enough to stand trial for his crimes. That is the meat and potatoes of this story. However, the effects of the story went on. The novella was viewed as inspiration in at least five mass shootings between 1988 and 1997. The book was cited as either being a favorite or even being in the possession of students that shot up their school. The book today would seem a bit tame by today’s standards but was enough for King to allow the book to fall out of print. King has since gone on to write an essay titled Guns after the horrific incident at Sandy Hook and detailed why he let Rage go out of print. Sometimes there are stories that mirror life so closely, not in the intention of the author, that are better off being allowed to sift through the cracks. This King story is an excellent example. It is is in my opinion, however, that this story is still worth being read. Copies of the Bachman books are available on Amazon and Ebay. This is the one King adaption you will never see become a film. King has been very passionate about his dislike of guns and would prefer this story just go away.